Happy New Year! We warm up gently, but hold on to your hats because these coming months your heart is going to be warmed and your feet a-tapping with all the dance coming to our wonderful town! It is going to be a good one! And one of the reasons why it is going to be a good one is because January 28 – 30 DanceHouse, in collaboration with the PuSH Festival and SFU Woodwards, presents Grouped’ArtGravelArt Group (Frédérick Gravel) in Usually Beauty Fails. The piece is a declaration of ambiguous love for popular culture and the high culture of dance. It is performed by nine dancers/musicians who break loose to the music of Grouped’ArtGravelArtGroup and the trenchant words of Gravel. 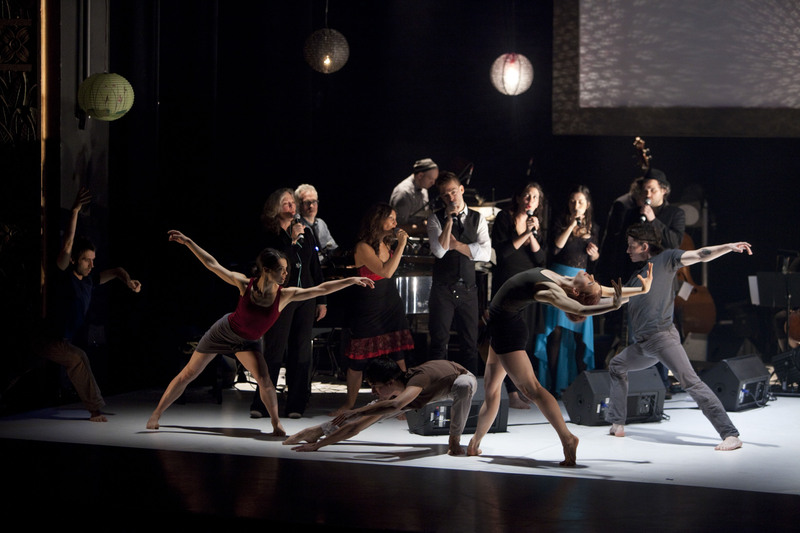 Following in the path of Gravel Works (2008) and Tout se pète la gueule chérie (2009), acclaimed both in Canada and Europe, this new creation contains physical intensity, rock music, and a coexistence of artistic genres. Frédérick Gravel is a dancer, choreographer, guitarist, singer, and lighting designer whose work is presented not only in underground performance spaces in Montreal and New York, but at scholarly symposia as well. Gravel cultivates artistic ambiguity, cultural meeting points, the mixing of disciplines, and post-modern irony. He plays with the contemporary zeitgeist; flippant and sceptical. He is complicit with the audience, thumbing his nose at the avant-garde; at the exclusive preserves of the elite. In lucid, offhand fashion, he takes popular culture and establishment culture out of their assigned roles and brings them together. Tonight and tomorrow you can catch Peggy Baker Dance Projects in coalesce & armour – an audio action tour. coalesce and armour are companion pieces inspired by the scientific essays of Lewis Thomas in his 70’s classic The Lives of a Cell, and performed to an electro-acoustic score by Debashis Sinha. coalesce is a complex and unpredictable inquiry into the nature of communication inspired by the mysterious and interconnected world of insects. armour, choreographed by Doug Varone, pairs Baker with Bessie Award winning dancer Larry Hahn in a spare duet that entangles the couple in a visceral act of connection. Although not only dance but a Festival of Performing Arts, do check out the PuSH Festival. Too much to detail here, but many, many wonderful shows to see over the next three weeks. Check it out! ~ by DanceHouse on January 10, 2014.